A midwife has told the Savita Halappanavar inquest that additional entries were made to her medical notes during an internal hospital inquiry. 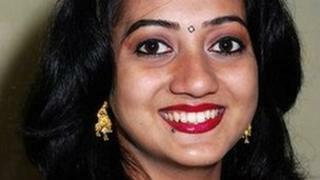 Mrs Halappanavar died in University Hospital Galway following a miscarriage last October. Her family claims staff refused her requests for a termination because Ireland is a "Catholic country". The witness, staff midwife Miriam Dunleavey, was working on the ward where Mrs Halappanavar was treated. In her evidence, Ms Dunleavey said entries were put into Mrs Halappanavar's medical notes by the hospital's internal investigation. It was set up after the 31-year-old dentist's death. The coroner raised questions as to the appropriateness of this action. Legal representatives for the hospital are to check the exact situation and report back to the coroner on Wednesday. A lawyer acting for Mrs Halappanavar's widower, Praveen, challenged Ms Dunleavey, saying she was too slow in seeking help from doctors when the patient's health deteriorated. Ms Dunleavy said that in her seven years at the hospital she had never seen any woman with an inevitable miscarriage become so ill so quickly. The hearing was also told that tests carried out on Sunday 21 October which indicated traces of an infection were not followed up until three days later. The inquest, which is being held in Galway, also took evidence from the consultant obstetrician who treated Mrs Halappanavar in the hospital. Dr Katherine Astbury told the court that she had been prepared to terminate the pregnancy if her patient's condition deteriorated, even if there was still a foetal heartbeat. The obstetrician read her witness statement to the court, giving a detailed, chronological account of the treatment she provided to Mrs Halappanavar. Dr Astbury said that she had requested an ultrasound on 22 October after her patient sustained a ruptured membrane. On the following day she said she told Mrs Halappanavar that the Irish legal position did not allow her to carry out a termination at that time, as there was no risk to her life or health. When Mrs Halappanavar's condition deteriorated the following day, Dr Astbury said she had formed the view that there might be no option but to consider a delivery, regardless of the foetal heartbeat, and had consulted hospital colleagues about this. However, a further scan confirmed the baby had died and Mrs Halappanavar was brought to theatre where a natural delivery took place on 24 October. She told the inquest that the couple's still-born baby daughter had six toes on each foot. Dr Astbury is due to be cross-examined when the inquest resumes on Wednesday.